Clean paws lead to a clean floor. The bigger the paws, the more mud your pup will sling through the house after a rainstorm. While paw cleaning might not be on your dog's list of enjoyable activities, it keeps your floors and furniture nice and clean. Treats make the process a bit more tolerable for your pup. Fill a bucket with lukewarm water. Any size bucket will do, but a larger bucket means less trips to the sink to dump it out and refill it. Throw an old rag in the bucket after its filled, and drop four tiny treats in your pocket. Bring a dry rag with you too. Greet your pup outside on a landing or deck. If you have grass immediately outside your door or only steps leading up to your door, place an absorbent mat inside your entryway and let your dog inside. It's dangerous to clean his feet on stairs, and wiping his paws clean while he's sitting on the muddy ground won't help anything. Tell your dog to sit or lie down. Sitting is best for pups who sit in peculiar ways with their back feet nearly off the ground or readily accessible, like German shepherds who sit way back on their haunches. For dogs whose back feet are glued to the ground when they sit, it's better to ask them to lie down. Ring out the soaked rag, and lift one of your dog's front feet. Wrap his little paw in the rag, and begin gently scrubbing his foot. Talk to him the entire time to reassure him that everything is fine and dandy. Wet the rag and ring it out again after it becomes covered in mud. After about 15 seconds, unwrap his paw and run the rag in between his paw pads, then in between his nails. Dirt often sneaks in between the pads and goes unnoticed during cleanings. If mud's allowed to stay in between your little guy's nails, it will harden and make it difficult to determine the location of the quick when you trim his nails. Inspect the paw once you're done cleaning to make sure you didn't miss anything, and then wipe it dry with a dry rag. Give your dog a treat, pet him and tell him how good he is. Then move on to the next front paw and then the back ones. 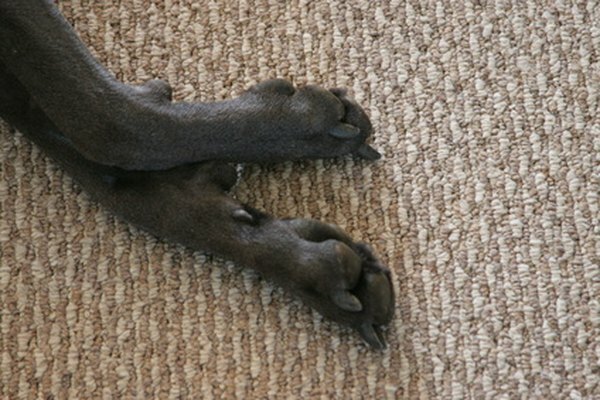 If your dog seems scared of getting his paws cleaned or flips out, slow and steady is the key. The Michigan Humane Society suggests just touching his paw with the rag at first. If he doesn't react negatively, praise him and feed him a treat. Go on to the next paw and repeat the process. After a few repetitions, your pup might touch the rag with his paws, which calls for more praise and treats. After he accepts the rag, start off with a quick wipe and gradually take it one step further. Refill the bucket of water once it begins looking dingy and cloudy. Avoid using soap. Soap can irritate the skin of certain dogs and isn't necessary for a quick paw cleaning. Don't dig in between his nails with the rag. Rubbing it along the nail will remove most dirt. After a few times, you won't have to give your dog a treat for each paw you clean, just after you're done with the entire cleaning. The treat is just there as positive reinforcement.